The first time I ate Biskut Arab or Ghee Cookies was when I was invited for Hari Raya to my friend Abdul Rahman’s house. I remember that day like it was only a few years ago. Abdul Rahman lived quite faraway from where I lived but I remember he would pray at the mosque in my area which meant he had to leave his part of town quite early in the morning to reach here in time (didn’t occur to me back then of course). Thinking now, it was a big sacrifice for him. So after prayers he would come to my house or I would wait somewhere and we would get on a bus. I never took buses back then, so it was kind of an adventure for me. It was so exciting I have to say. I cannot even remember where he lived, because the bus ride was so exciting and we talked and talked so I really and truly cannot tell you where he lived but I am pretty sure it was like a long house. Rows and rows of half wooden houses and we would get off the bus and I would plod along with him, through these rows and rows of houses and there his mother Mak Cik, would be there to happily greet me. And then the cookie trays would come out and of course I have no shame at all, because I love home made cookies. Long time ago, the Malays always made their cookies differently, it would as my mum would say a Malay Village smell, and Mak Cik’s cookies along with my Aunty Shina’s cookies. You never get that scent or smell in Malay cookies anymore unless it comes from a village far away. Only one other person came close and that was my other friend Muhammad Aidil. 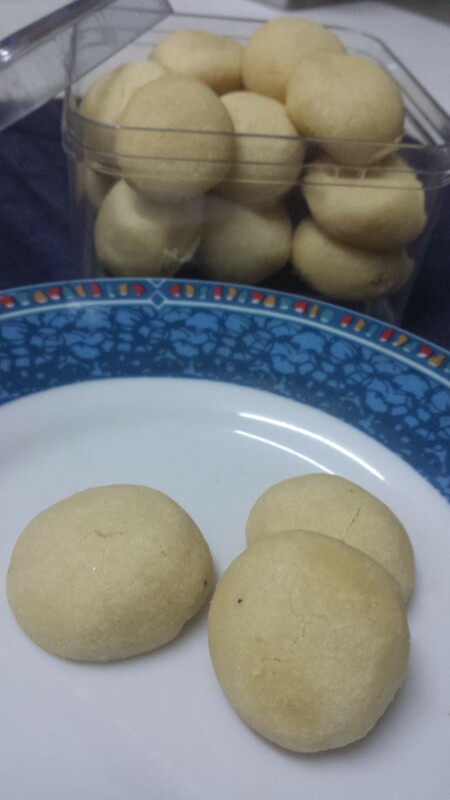 His mother and sisters gave me cookies reminisce to the good old days only because he was from a village in Johore. The smell, the scent of each cookie was just indescribable. I was told a few years ago, this smell was created because all the flour and sugar and anything dried that needed to go into the making of cookies were dried in the sun before the baking took place. People do not do this nowadays. So this year my friend Hafiq gives me a recipe book. He made wonderful Rendang Tok and Peanut Sauce from this book. And I, made this cookie. I had to change a few things because somehow it would not come out right if I followed the recipe to a T, so here goes. The end result was the closest I have ever tasted to Abdul Rahman’s mums Biskut Arab. Still hers tasted better, probably because no one really bothered about sugar back then. 1. Dry fry the flour for a few minutes in a non stick pan till it is a light light creamy brown. Make sure it is on low flame. Leave to cool and Sieve it before use. 2. Preheat Oven to 170 to 180 C. Grease two cookie sheets. 3. 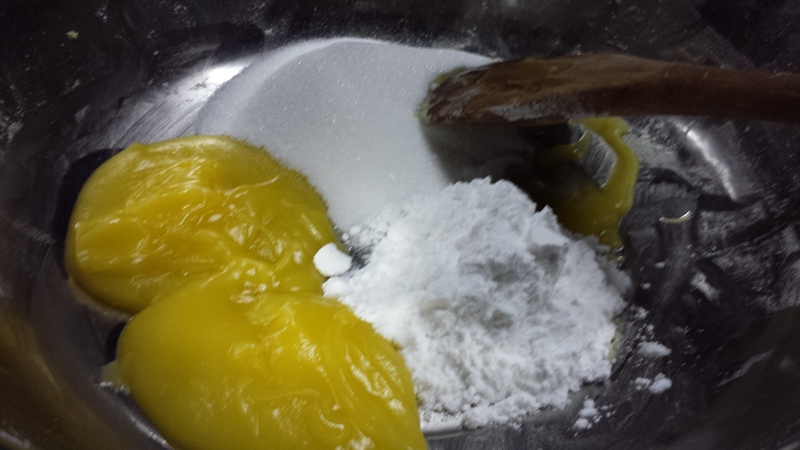 In a bowl, mix in Ghee with both sugars. 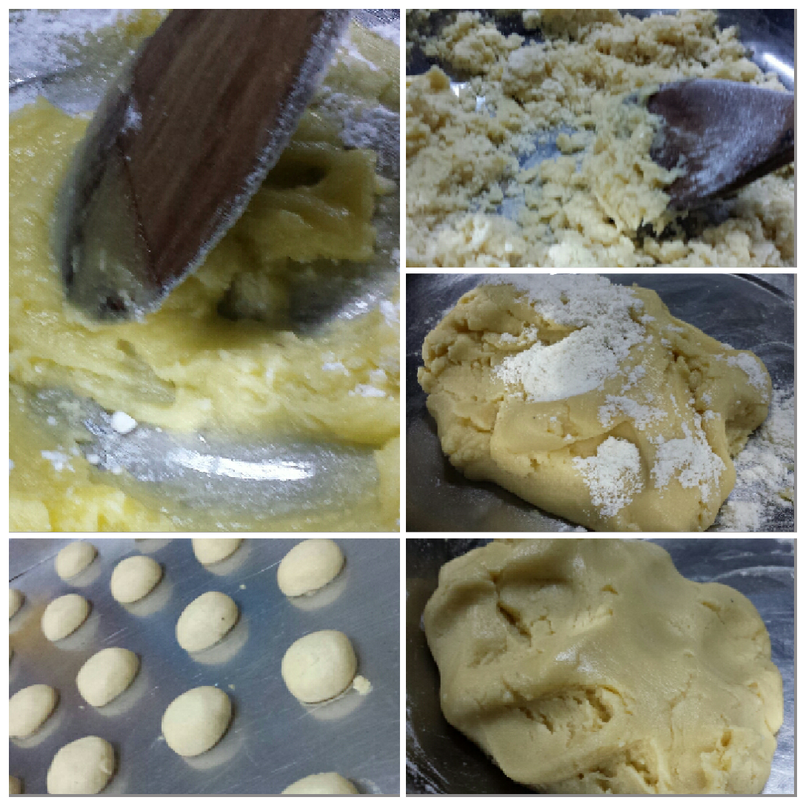 Gradually add in flour 1/2 cup by 1/2 cup till you are able to combine the dough and it is still soft but till in one piece. You may use up all the flour or a little more of less depending on the temperature of the day. 4. Make round balls, place on a greased tray and bake for about 20 minutes. I always start at the lowest rung and work my way up every 5 minutes or so. 5. Remove when it is done. Cookies might not be very brown of perhaps it is just me not liking brown cookies. Leave to cool and gently remove from tray. Cookies should melt in your mouth. 6. I place some in the fridge just so it will harden. Cookies were just divine. sweet though, so you can cut some sugar but do be careful as cutting down too much sugar might affect the texture. You may modernize these cookies with a bit of Maddons Salt Flakes to kill the sweetness. All in all I loved it. It made me think of Mak Cik and Abdul Rahman… and the late Aunty Shina. By the way Mak Cik also made unforgettable Beriani. You see food always brings us all together regardless of belief and creed.